I work on a scenario for our first large battle: Dettingen. That is a work in progress as is the scenario for Pfaffenhofen. I will post my experiences after our first game. River Main is unfordable. The Forchbach is fordable on a 2-6 except in the sector with the marsh. First French Brigade can move for free. Has to charge the first turn! Fires first before the French M.du Roi charges. Cannot fire, when friendly units are engaged in the line of sight. Heavy always at medium range, medium at long range maximum. The historical battle was a lot more complex: many of the French Units were arriving late and more stumbling into the battle than propper advancing. How far form away from the Pragmatic allies is that is that battery of Heavy guns? It's looking like 20cm. Perhaps I will not put the guns on the table but use the pre-bombardement-rules by Keith only. In the real battle the batteries did a lot of damage in the beginning of the actions but could not fire again after the charge of the Maison du Roy. The Main is in this area a very wide river. On the plans of the battle it's clear that the pragmatic army had not enough space for propper deployment. So the formation on the wings of the army were very deep. I changed this a bit because if I would not do this the table would have to be much bigger. As a work in Progress I'm thinking about victory conditions. It seams very unlikely that the French could break the pragmatic army. I don't know which demage the heavy french artillery will make. It would be perhaps a good idea to led the artillery fire only for one time. If the French player has a lot of luck, this could cause a lot of problems for Cumberland's wing. Cumberland's first line will have the honour to fight the maison du Roi. Perhaps the artillery will cause enough of demage, that the first line will retreat. That would be very historicaly. Maybe the French could win, when the not break before turn 9. Better ideas? Please note, that the French will have no CinC before Noailles' arrival. I believe that this recreate very well the situation of chaos and the lack of discipline. I could not find one note that Grammont had produced a real plan for this battle. interesting refight (hope my OOBs will help). Interesting point you make at the end - Basically Grammont was told told stay put behind the stream (which was relatively unfordable) and just hold the Allies off until the heavy guns over the Main did their job (in enfilade) and the rest of the army under Noailles was able to come up and close off the mousetrap. We can obviously criticize Grammont for the blatatnt disobeyal of orders, but an unbiased reader must consider that - at least on the Allied Left - the French crashed through several Allied lines and it was lack of momentum as much as anything else that conributed to the ultimate French defeat. I think that it is remarkable, that there was not much bashing of Gramont after the battle - although he never get such a important role in a battle again (perhaps only because he died 2 years later?). Perhaps it's true that it was not completely his fault. It is possible in my point of view that his subordinates ordered their brigades to advance. I have sometimes the impression of old French chivalry maybe surviving in the hearts of the French noble cavalry. I noticed in the description of the battle that the maison du roi attacked first and after that Noailles had to send Brigade after Brigade to reinforce the troops on the wrong side of the Forchbach. Dr. Johann W. Steiner (1834) gives not a clear account of the reasons of Grammont. He characterized Gramont as quick-tempered or hasty and young*. He said that there were still 2 brigades only who had crossed the Forchbach when de Noailles arrived from the other side of the river. And he said that Gramont relied on the bravery of his guards. So maybe the guards crossed first, what would fit in my suggestions. Porges/Rebracha (1901) weigh up the reasons of Gramont to attack the allies. The austrian book does'nt include my version of aristocratic motivations... Porges/Rebracha mention the possibility that Gramont thought that the allies were retreating and he had the chance to attack them in the rear. If that was the case, de Gramont made a real fault. To advance with only parts of his troops was very dangerous. * I believe that there would be disputs during the 18th century that a man of 54 is a young man! In any other army such an action was dereliction of duty and would (or at least could) be severely punished, cf. George Sackville at Minden.....In the French army as senior military rank was a birthright more than anything else, there was a different approach, a belief - if you will - that nobility covered all sins. Lt-Gen Louis, Duc de Grammont. Main Body under Noailles to follow, and then as research progresses I'll start fleshing it out. This is the rest of the French Army under the overall command of Marshal de Noailles. As per my last as I get a chance to refine it I'll be putting in commanders, locations etc etc. Artillery am still looking into although the batteries on the southern bank of the Main apparently totalled 42 "heavy" pieces. I would be loathe to treat these as large calibre cannon and are most likely a mix of 12, 8 and 6 lb pieces. I had the Impression that only parts of the main Body arrived at Dettingen. The brigade Navarre surely did. It's somehow irritating that britishbattles shows one modern map where you can not find any cavalry on one (the left) french wing. 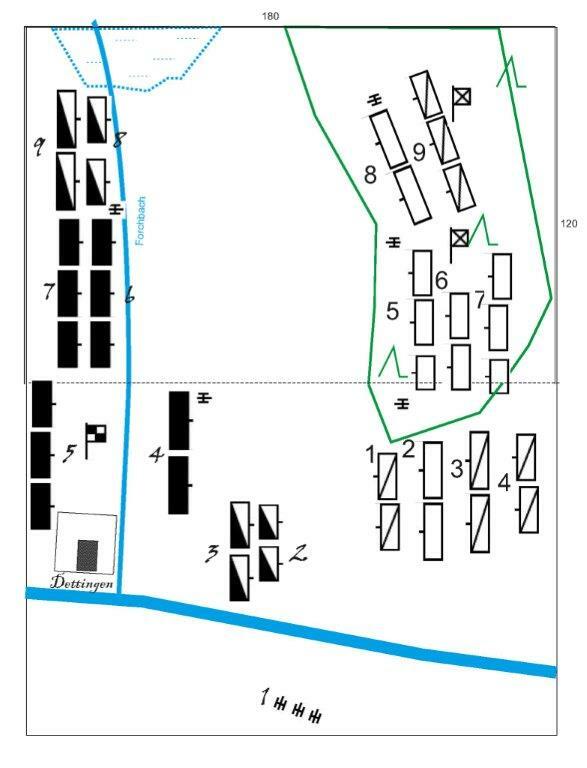 But on the contemporary map in the same article the french cavalry is deployed on both wings in 3 lines. It seams to me that the contemporary map is'nt too bad. The french artillery (except the heavy batteries on the banks of the river Main) is behind the Forchbach. Perhaps the french advanced so hasty that the artillery could not cross the Stream without help of the infantry. To complete the thread: link to the OOB of the allies. I see, that I will Change my OOB a bit for my first testgame. For all fans of frontal assaults: now I managed to load up again the map.